Over 100,000 medals and honors were awarded by the Air Force and Army during the Iraq War, according to MSNBC news. 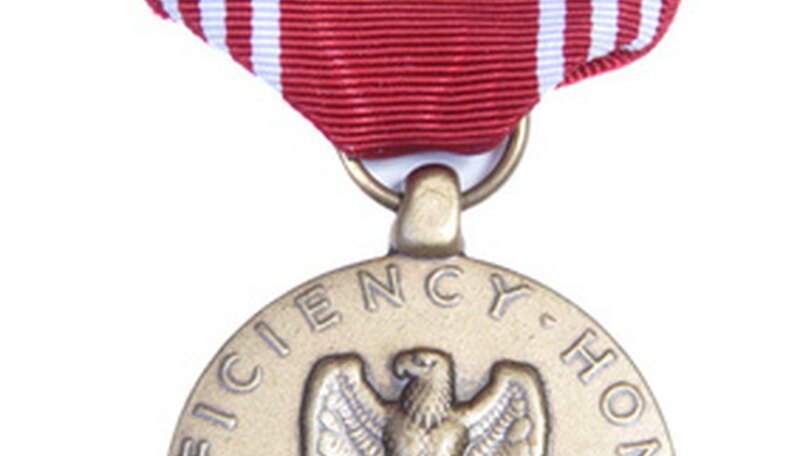 The Army issued over 40,000 medals including 13,000 Bronze Stars and 111 Silver Stars. The Air Force issued 69,000 medals and other honors, including four Air Force Cross medals and 1,900 Bronze Stars. The Marines have been much more conservative, only awarding a little of 1,000 medals, says the news outlet. Service members often receive the same award multiple times, which means service members have to add devices like bronze stars and oak leaf clusters to the ribbons they wear on uniforms. While the process is simple, getting it right can be tricky. Place the ribbon on a flat surface. Center the device over the ribbon. Stick the device through the fabric, then pick up the ribbon and slide the device all the way through. Flip the ribbon over and lay it flat on the table. Bend the two posts outward. Push the posts flat against the back of the ribbon. Buy a duplicate ribbon in case you are not sucessful the first time. Alan Boleware, Alan's Medals, Satellite Beach, Fla.
Julie Boleware has been writing since 1997. She has been published on the Internet Public Library and various websites. Boleware's interests are in arts and entertainment and business. She holds a Bachelor of Arts in communications from Cameron University and a Master of Library and Information Science from Florida State University.